You can pay by bank deposit directly into my bank account, or use PayPal to pay by debit card or credit card. How do I know you’ve received my order? You will receive a confirmation e-mail as soon as you place your order. Our system also sends update e-mails when your payment is processed and your order is sent. Once I receive your payment, I will ship your goods within 5 working days (usually much sooner). I send all orders by courier. Courier delivery takes a day or two, but please allow more time for rural delivery. The courier company will send you an e-mail with the tracking number. If your parcel hasn’t turned up within 7 working days, check its progress on the courier tracking website. Please contact me if you wish to purchase from overseas. I’ve changed my mind and no longer want my product. What can I do? Aww, I’m sorry! Of course I want you to love Pepin Design products. But if your order is not quite what you wanted, we’ll work something out. If you aren’t satisfied with your purchase, you must let me know within 7 days of receiving your order. Use the Contact page to request an exchange. I do not provide refunds unless the goods are faulty. You will need to send the unwanted products back. Once I’ve received them and confirmed they are in a saleable condition, I can send your replacement order. You must pay for postage on the returned goods and the replacement order. What if my goods are damaged or the product I received is wrong? If you receive goods that are damaged, or I have sent you the wrong item, please let me know straight away so I can sort this out for you. Send me a message via the page within 7 days of receiving your order. If goods arrived damaged, it’s helpful if you can e-mail me photos of the damage, so I can follow this up with the courier. If you need to return the damaged or incorrect goods, I will pay for postage. Your vinyl decals have damaged my wall. Will you pay for the damage? No. We are not responsible for any damages due to the use or misuse of vinyl decals. If you couldn’t bear to damage an object or surface, don’t try to stick a decal on it. The FAQs page has detailed information on applying and removing decals. The website will only ask you for the details I need to process your order—your name, address, and contact e-mail address. Creating an account is optional. If you create an account, you can log in and view all your past orders, save your delivery address, and place new orders more quickly and easily. Does anyone else see my personal information? No, only me. I take your privacy very seriously. I wouldn’t do anything with your data that I wouldn’t want done with my own. 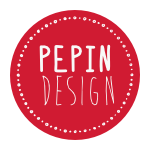 Pepin Design will not sell, share, or pass on your private information to any third party without your permission. How secure are my financial details? I never see any of your banking details. PayPal does not share your financial details with me, and takes great care to protect your data from theft or fraud. Will I be signed up to your mailing list automatically? You can choose to subscribe to my newsletter when you place an order, or while browsing the website. I use an “opt in” method, so you will never be signed up without your knowledge. The e-mail newsletter is sent out occasionally to let you know about upcoming markets, sales, and new products. Every newsletter has an Unsubscribe link, and you can unsubscribe easily at any time. I send newsletters via MailChimp, which has a strong policy against spam, and a very reliable unsubscribe process. By accessing and using this website, you are agreeing to these terms and conditions. These terms and conditions may change at any time.